This post was brought to you in collaboration with Fresh Step, but all words, thoughts and opinions are my own. We have a LOT of animals in our house, two of which are cats. We have two litter boxes, and one sits right in the living room. It is a constant battle to keep it clean and smelling fresh, so that the first thing people smell when they walk in my house is not the overwhelming stench of cat. Over the years, I have tried just about every litter there is, so when I received a "sniff test" of three different types of litters in the mail, I didn't think there would be that big of a difference. How did it go? Who won the sniff test? Check it out! First of all, being the impatient person that I am, I opened the three canisters "A," "B" and "C" and took a big whiff right away the moment I opened the box from the mail. I thought we were just trying to see which smelled freshest, I didn't know they might smell bad. The first one I sniffed was container "A" and it was horrible! After that, I sniffed with a little more caution. Container "B" was next and it was pretty fresh smelling, so I again took a big whiff of "C" and really wish I hadn't, because it was the worst of all. What did I learn? Container "B" held the new Fresh Step® Triple Action Litter with plant extracts. This new litter contains both chlorophyll and essential oils. The Chlorophyll binds with odors and helps keep them out of the air, while essential oils help mask and hide the bad odors before they leave the box. The activated carbon that is in Fresh Step® Litter helps eliminate the odors for good too. All three of these together combine to create an odor force field that not even the worst smells get though. Don't take my word for it though, check out my oldest and the cats doing the sniff test. 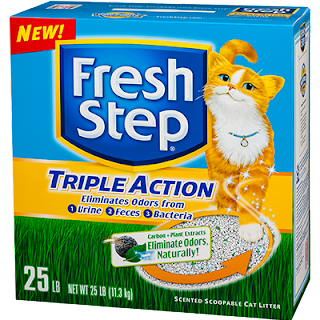 We have been using the new Fresh Step® Triple Action Litter in the house for a a week or more now, and the smell is so much better. Especially with multiple cats, I am so glad when I don't have to worry that the stench of the cats won'd scare company away now. You can buy Fresh Step® Triple Action Litter at retail stores across the country, as well as online, the regular retail price is $10.29 for a 20lb. box! Have a cat and want to give Fresh Step® Triple Action Litter a try for yourself? Here's your chance. Enter to win one of five coupons for a free box! we would love to try it because it seems like it would ward off smells better. I'd like to win so I can try it. I'd love to try it to see if it does a better job than Tidy Cats. B/c I have a cat and will try anything to help with the smell. I want to win this for my cats because we didn't try this brand yet. I'd like to try this because I want help winning the battle against cat box odor! with 3 cats I need all the cat litter i can get. I would like to try it because my litter box kitty is now only wanting to go outside to do her business, so I am thinking she doesn't like her litter. I would love to try it with my two cats. We need something to control the odor. I HAD to put the cat litter near our living area. The cat here is OLD and he doesn't do stairs well anymore. Good thing is I don't have to have more than one litter pan anymore but bad cause of where it IS.... yes, one needs GOOD litter now. I would love to try this because I have 2 kitties. 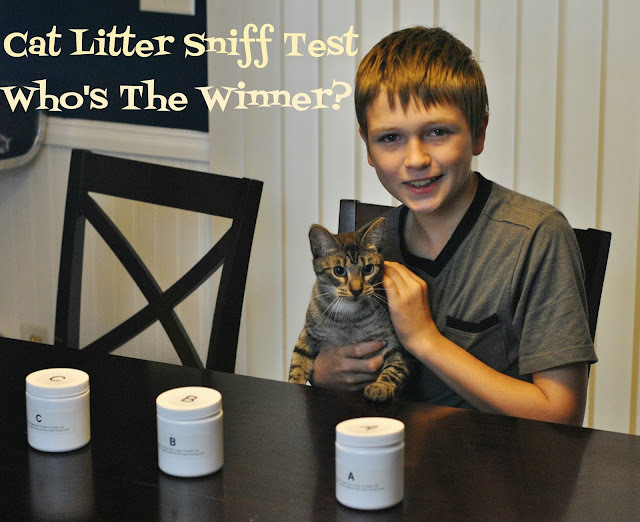 Litter odor is sometimes a problem....thanks for the very useful giveaway and great review! I would like to try the new litter because i think it will work great. I'm always looking for a fresh smelling and effective litter for my two cats! I know Fresh Step makes a good product and want to try their latest and greatest. I have 8 cats. i need to try something new. I would really like to find out if my cats like this cat litter. I have 5 kitties. They can make stinkies. I'm not happy with my current litter, so I would definitely love to try this. I'd love to try it because our current cat litter just isn't doing the best job with the smell. Although I clean the litter box frequently, the smell can still be awful. Anything that would help cut the odor would be great. I have a little "angel" who likes to use the register by the front door as a litter box. Maybe she'd like a different litter? I would like to win this for my sister's cat. I would love to win this for my cat. love to see if it works better for smells. We live in a small home with 2 kittens--it is easy to become...overwhelmed. We have 3 kitties... I am on the lookout for the best clumping and odor reducing litter... I need it BAD! Because I need a good litter! I keep it in the garage and I feel like it smells up the whole thing! I would like to try it to see if it works better than m current brand. I want to try this "odor force field" for myself. I have two smelly cats. We have 5 indoor cats! Would love to try it to see if it would help with cat odors. I've been searching for a good kitty litter product. we have 3 cats and we are always looking for a great litter to use! I have three cats so I need a great cat litter. Would love to try this one. I would like to try it and see if it works better than what I currently use. plus, I'm always looking for new products to try! I would like to try and see if it smells better than my current cat litter! The last cat litter I really liked gave my kitty an allergic reaction and I haven't found one that I like as much yet! No matter what we try, we always seem to have at least some cat odor in the house. my cats like this cat litter. I have two cats and am currently looking for better litter. I have five cats and it really stinks sometimes around here! I am interested in trying this. We have just 'adopted' a stray kitty, and the litter we have now is pretty unpleasant. We have 3 kitties and it'd be nice to find a litter that can mask the smell of stinky litter box. I would love to try this litter so that I may compare it to the other litters I have tried! I have two furry baby's inside & I want to use what's best for them, with great odor control it would also be best for the entire house! Thanks. I would like to try it because I have two cats and I want to cover up their stinky cat poo odor. I like the fact that kitty likes it.